On November 30, 2008, Rev. Tony Ponticello addressed the congregation at the Community Miracles Center in San Francisco, CA. What follows is a lightly edited transcription of that lecture. Fundamentalist Christianity has an expression that you hear bantered around a lot. The expression is, “We love the sinner, but hate the sin.” It is frequently used when referring to homosexuals. Fundamentalists would have us know that they do not hate homosexuals. Christians love all people, but it’s the sin of homosexuality that they hate. The expression is used for other things, but it certainly comes out every time some issue of gay rights comes up. I heard it recently when the Proposition 8 issue was being voted on. That was not a great day for gay rights, because the passing of Proposition 8 meant that the California state constitution has now been amended to define marriage as a union between one man and one woman. This prevents any gay couple from getting married in California. It also created a very interesting distinction, because a large number of gay couples did get married in the short period of time when it was legal. Now we have these legally married gay couples, but there will be no new gay married couples unless more legal action is taken. Other legal action is in the works. However, I’m not here to talk about legal action. I’m here to talk about sin and error. I looked up the idea that we love the sinner but hate the sin on the internet to try to get a little more information about it. There is a lot of information about that particular saying and I found it very interesting because most of the information written by Christian scholars, or ministers, was saying how that is actually not a Christian statement and should not be used by Christians. They say there is nothing in the Bible that even closely resembles that statement. The best anyone can do, to attribute the phrase, is to say something very similar was said by Mahatma Ghandi. “Hate the sin; love the sinner.” He didn’t use exactly the words we hear now but it’s close enough. Let us assume that Mohatma Ghandi said this on not such a good day, because traditional Christian theologians, or teachers, have problems with the idea of loving the sinner but hating the sin. The word “sin” itself is translated from both Hebrew and Greek. The Hebrew word is “chatta’t”; the Greek word is “hamartia.” These are literally translated as, “separation from God.” The Greek word “hamartia” did originate from an archery term that simply means that the arrow missed the mark. Many people know this. 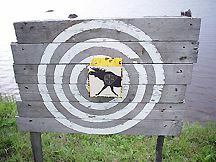 In archery, you aim towards the bullseye of the target, but if your arrow goes astray, makes a wrong turn, takes the wrong path, you have a “hamartia.” That means you’ve missed the mark. This word also became common to mean we had missed the mark of God, or we had strayed from the God path. We had taken a wrong turn, the wrong path. We went astray. This isn’t that much different from the way A Course In Miracles would have us look at things. We are just missing the God mark. We’re on the wrong path; we’ve made a wrong turn. When traditional Christians use the phrase, “We love the sinner, but hate the sin,” I do want to acknowledge they usually consider this to be a loving statement. It is the traditional Christian trying to say something nice. We shouldn’t just throw it out all together. It is probably the most loving thing they can think of to say, especially when they are considering people who do things, or have a lifestyle, that Christians find reprehensible, abhorrent, or sinful. What Christians mean is, “We don’t actually hate you, ...” the homosexual “... but we hate what you are doing. So, would you please stop it. Then we won’t have to hate what you are doing and our love for you would be complete.” This is a strong sentiment for traditional Christians. A recent example of just how strong, is in the fact that the Mormons, and other traditional Christians, got together, amassed huge amounts of money and pushed through the acceptance of Proposition 8 that amended the California state constitution. It’s a very strong sentiment. I’m sure Mormons wouldn’t say that they hate homosexuals. What they wanted to do was prevent homosexuality from being officially sanctioned by the government, which they saw in this idea that gay couples could be legally married. A Course In Miracles says many different things pertaining to this discussion. ACIM wouldn’t hate a so called sin, because sin is a behavioral thing and ACIM does not talk about behavior of any kind. The Course says that there is no correction at the behavioral level, all things have to be corrected at the mind level. ACIM has an important teaching about what happens when we try to do behavioral correction. Traditional Christians want there to be a behavioral correction. “You’re a lovable person just stop your sinning. Stop that behavior.” ACIM talks about how difficult this would be, how inauthentic it is, and how it doesn’t actually correct anything at all. A Course In Miracles tells us when we try to correct things on a behavioral level we are engaging in two kinds of errors. “First, you can will to do conflicting things, either simultaneously or successively. This produces conflicted behavior, which is intolerable to yourself because the part of the will that wants to do something else is outraged.” (Tx.Or.Ed.4.77) If you effectively do conflicting things you will be outraged with yourself because of that inconsistency. That isn’t going to work. “Second, you can behave as you think you should ...” This must be what the traditional Christian would like of homosexuals, “... but without entirely willing to do so. This produces consistent behavior but entails great strain within the self. In both cases, the will and the behavior are out of accord, resulting in a situation in which you are doing what you do not will. This arouses a sense of coercion, which usually produces rage. The rage then invades the mind and projection in the wrong sense is likely to follow. Depression or anxiety is virtually certain.” (Tx.Or.Ed.4.78) If we could actually do what the traditional Christians want us to do – love the sinner, hate the sin and therefore the sinner should stop the sin by just stopping the behavior – we would be setting ourselves up for depression and anxiety. This is what the traditional Christians would set up in the mind. If we just try to control our behaviors we are setting ourselves up for depression and anxiety. I think all we have to do is look around the world to realize how prevalent depression and anxiety actually are. Many people are probably trying to just control their behavior without changing anything else, because they believe their behavior is the most important thing. A Course In Miracles tells us that the only control, the only correction there is, is in the mind. All we should ever do is change our thinking. If we change our thinking our behavior is going to naturally reflect that. A Course In Miracles continually has us move away from this idea of sin altogether. There is no such thing as a “sinner,” in the ACIM theology, and there is no such thing as “sin” in the ACIM theology. The Course always wants us to reperceive sin as merely a mistake. (See Wk.Or.Ed.359) Since there are mistakes, there certainly are people who make those mistakes, which would be all of us. We all make mistakes. The origin of the word “sin”, when we go back far enough, truly did mean just to make a mistake, to miss the mark. We can see that at one point the terms “sin” and “mistake” actually meant the same as thing. Over the years, and through the evolution of language, sin has taken on a very different meaning. It’s more than missing the mark. It implies that something bad has happened and now some form of punishment is due to the person who has done this bad thing. A Course In Miracles has gone back to a much more original version of the word because ACIM does spend a lot of time talking about the correction of error. Early in the book it says, “As you share my inability to tolerate lack of love in yourself and others, you must join the Great Crusade to correct it. The slogan for the Crusade is Listen, learn and do: Listen to my voice, learn to undo error, and do something to correct it.” (Tx.Or.Ed.1.31) That’s supposed to be the slogan of the Great Crusade we are on. I love this passage that comes from the Original Edition. In the FIP/FACIM version there is no mention of a slogan for the Great Crusade. I like the fact that the Great Crusade has a slogan. “Listen, learn and do: Listen to my voice, learn to undo error, and do something to correct it.” (Tx.Or.Ed.1.31) That is what we are always supposed to be doing with our minds. We’re supposed to be looking for the error and then listening to the Holy Spirit for what we are to do, how we need to change our thinking, in order to correct the identified error. Then we should do this something to correct our thinking. That’s what we are here to do. Chapter 19 in A Course In Miracles has a section that is titled “Sin Versus Error.” I’m going to read a number of passages from this section because I think they all are very important for us to understand. We must get this distinction between sin and error. “It is essential ...” (Tx.Or.Ed.19.17) I always love when ACIM tells us something like this, that it is essential, or necessary, because it always causes me to perk up my attention, “... that error be not confused with sin, and it is this distinction which makes salvation possible.” (Tx.Or.Ed.19.17) We’re never going to be able to save ourselves, heal ourselves, if we don’t make this distinction between error and sin. If we don’t change all these ideas of punishment and guilt that are wrapped around sin and move the whole sin concept to an error that can be corrected, we’re never going to heal ourselves, save ourselves, heal the world, or save the world. This passage continues, “For error can be corrected, and the wrong made right. But sin, were it possible, would be irreversible. ... Sin calls for punishment as error for correction, and the belief that punishment is correction is clearly insane.” (Tx.Or.Ed.19.17) That’s a great line. You could spend hours just talking about that line. “The belief that punishment is correction is clearly insane.” (Tx.Or.Ed.19.17) Think about all of our “correctional institutions,” the jails, that we have in our society where criminals – people who have done bad things, people who have sinned – are put by the government as a form of punishment, and also as a form of protection for society. We think we are taking this evil element out of society. To think that this incarceration is going to correct something is clearly insane. It doesn’t correct anything. It doesn’t change anything. Historically, jailing people hasn’t done anything to reduce crime. Crime is still rampant. You put more people away, inside the jails, and more crime happens with the people who are left outside. Nothing is really changed. ACIM wants us to look at all those things and to confront those societal ideas. When I was a young Catholic boy, we were indeed taught that sin was something that we had to do penance for. That penance was thought of as some form of punishment. We had to say a certain amount of prayers when we admitted to our sins. There was also an idea, as well, that the prayers would be a healing influence, but that was mostly lost because no one focused on us paying attention to the words of the prayers we were saying, trying to have us absorb the meaning of the prayers. We just had to recite the prayers so many times. Somehow, reciting the words by rote memorization was going to redeem you. If you look up the word “penance” in the dictionary it says, “an act of self-abasement, mortification, or devotion either voluntarily performed to show sorrow or repentance for sin or imposed as a punishment for sin by a church official .” We were required to do penance. The priest, the church official, chose what prayers we were to say and how many times we were to say them on the basis of the sins, or the crimes, that we had committed. To think all of that was going to heal us was clearly insane. I point all these things out to show how very different this theology that we’re studying is, from the more traditional theology. Even though A Course In Miracles uses very traditional words, and at a quick glance you can think that they are compatible, they actually aren’t, because at foundational levels they have very real differences. There is no idea of punishment and guilt in ACIM, and there are ideas of punishment and guilt in traditional Christianity. If we continue on from the passage I read before it says, “Sin is not an error, for sin entails an arrogance which the idea of error lacks. To sin would be to violate reality and to succeed. Sin is the proclamation that attack is real and guilt is justified. It assumes the Son of God is guilty and has thus succeeded in losing his innocence and making himself what God created not.” (Tx.Or.Ed.19.18) Sin assumes that the holy child of God is actually guilty. He has truly lost his or her innocence. A Course in Miracles wants us to remember that we are always unable to loose our innocence. It is who we are; it can’t be lost. We can move away from the awareness of it, but we can’t loose it. In order for us to feel this within ourselves we have to see this innocence in everybody else who we come across. We have to see it in all of our political leaders as well. We have to see that George W. Bush is actually innocent. He didn’t loose his innocence by taking us into war with Iraq. He is still an innocent, holy Child of God. We have to see that Sarah Palin is innocent. We have to see that the Mormon Church is innocent for launching this huge, expensive campaign that voted in Proposition 8 and made it impossible for people of the same gender to get married in the state of California. Then, of course, there is the greatest example in history, Adolf Hitler. We have to see him as innocent too. I am very grateful for the example of Adolf Hitler because he is that ultimate symbol of sin and evil. If we ever want someone about whom we can say, “He’s evil” Hitler will always work. Everybody knows who he was. Everyone can relate to his example. Everyone agrees. You just have to say “Adolf Hitler” and everybody knows that he is the greatest personification of evil that ever existed on the planet. Yet, A Course In Miracles, with the shift in perception it asks us to do, would have us understand that he’s not a sinner either. He only made mistakes. Those mistakes can be corrected through us now. Obviously, Hitler can’t, in body, correct those now because, bodily, he isn’t with us. However, since he’s still connected with us in mind, we can correct all the errors that he made in his mind, now. They all can be corrected. It’s not that these people, George Bush, Sarah Palin, the Mormon Church, or Adolph Hitler didn’t make mistakes. They obviously did make mistakes, but we obviously make mistakes as well. As we correct our mistakes and as we reaffirm their innocence as just mistaken people, a healing can happen. That’s what we are here to do, and that’s what ACIM helps us to achieve. The healing that comes from the correction of mistakes will never come if we change those mistakes into something bad like sin. Sin only calls for guilt and punishment. Let’s continue on with this passage, “The Son of God can be mistaken...” (Tx.Or.Ed.19.19) This get confused in some A Course In Miracles students. They want to affirm the Son of God’s innocence, always see him as innocent, which he is, but then some ACIM students forget that even the inherently innocent can make mistakes, and frequently do. The passage continues with, “... he can deceive himself; he can even turn the power of his mind against himself. But he cannot sin. There is nothing he can do that would really change his reality in any way nor make him really guilty. ... For the wages of sin is death, and how can the immortal die? – A major tenet in the ego’s insane religion is that sin is not error but truth.” (Tx.Or.Ed.19.19-20) Sin is indelible. It’s an indelible black mark on the soul. That’s how I was taught it when I was a young Catholic boy. Sin was a dark mark on our souls, that we could not take off ourselves. Taking off this soul smudge took the intercession of the priest and God through the sacrament of confession. Only after we had done our punishment – after we had done our penance – only then we could be reprieved. I am very grateful that I don’t believe in this anymore. I have come to a different spiritual discipline that is teaching me something different. Let me continue, “Any attempt to reinterpret sin as error is always indefensible to the ego. The idea of sin is wholly sacrosanct to its thought system ...” (Tx.Or.Ed.19.21) When I looked up the word “sacrosant” in the dictionary I found it simply meant “a holy thing.” Rereading this line with that in it, would give us, “ The idea of sin is wholly ‘a holy thing’ to its thought system ...” “... and quite unapproachable except through reverence and awe.” (Tx.Or.Ed.19.21) Sin is very holy in the ego’s thought system. Listen to any gathering of unenlightened people and mostly what they talk about are the sins that are going on at their job, in the country, in the society, in their families – all the bad evil things other people are doing that are troubling. The ego holds these bad things holy. The ego constantly has to reinforce these bad things. It constantly has to play this sin scenario out. The previous A Course In Miracles passage told us that, to the ego, sin is unapproachable except through reverence and awe. “It is the most holy concept in the ego’s system lovely and powerful, wholly true, and necessarily protected with every defense at its disposal.” (Tx.Or.Ed.19.21) The ego will always want to defend this idea that sin is true. It’s very easy to do this with the people who are public figures and who we don’t have to encounter on a day to day basis. We do it with the every day people as well, but it is so easy with the others. No one tries to correct this when we do it with people like Sarah Palin. She’s just a sinner for her beliefs. She’s not merely a mistaken person. People don’t want to see her as a mistaken person. Since she is a fundamentalist Christian herself, she is actually someone who would likely say she loves the sinner while she hates the sin and think of that as a loving statement. However, can we truly love and hate together? That’s what A Course In Miracles wants us to see. Those two states are antithetical. You can’t love the sinner and hate what he does. It’s not going to work in the ACIM thought system. The Course says this very directly. “Here [the ego’s fantasies] are usually judged to be acceptable and even natural. No one considers it bizarre to love and hate together, and even those who believe that hate is sin merely feel guilty and do not correct it.” (Tx.Or.Ed.16.44) In the ego’s thought system it isn’t considered bizarre to love and hate together in the same relationship. We think that’s natural, and even if we don’t like hate, and think that hate is wrong, we just choose to punish ourselves for the hate. We feel guilty for it. We don’t try to correct any of it. ACIM is challenging us to see these things very differently. Let’s continue with the quotation from Chapter 19, “It can indeed be said the ego made its world on sin. There is no stone in all the ego’s embattled citadel more heavily defended than the idea that sin is real the natural expression of what the Son of God has made himself to be and what he is. To the ego, this is no mistake. For this is its reality; this is the truth from which escape will always be impossible.” (Tx.Or.Ed.19.22-23) The ego has built it’s whole system on this foundation of sin. Every stone in the foundation is built upon sin. I see that this is true. If you look through the history books, the history of mankind is mostly about the wars, the battles, who fought who, the warring Chinese states, the warring Greek city states. It’s a whole history of war. What is war but the projection of a society about the evil of another society, an evil so bad that the other society deserves murderous punishment. We glamorize all of this. Three hundred Spartans fought off the Persian army at Thermopylae in 480 B.C., and we consider this a great event in history. We talk about the bravery of those 300 Spartans and how they went up against the incredible odds of a vast Persian army. Even though the Spartans eventually lost the battle, the tide was turned and a year or two later the Persian army was thrust out of the land. There was the movie two years ago named The 300 that was very bloody, but also very popular, because of this grand idea of how heroic this battle was. How heroic it is to perceive guilt and evil out there, to perceive that others have done such a terrible thing that punishment is called for. The history of the world is founded on this, time and time again. Yet A Course In Miracles tells us to ask ourselves a simple question, “Would you not rather that all this be nothing more than a mistake, entirely correctable, and so easily escaped from that its whole correction is like walking through a mist into the sun? For that is all it is.” (Tx.Or.Ed.19.24) We have to see all of this as just a mistake. It’s just a mistake in perception. It’s a mistake in the interpretation of that perception. There obviously is the perception of a mistake, but it’s how we interpret that mistake that is so very important. We have to interpret it as something entirely correctable, something that we can correct in our own minds. We have to interpret that the Sons of God, us and the others, have not lost our innocence, and we all are still holy. Here is one last quotation in this section in Chapter 19. It contains another compelling reason to make the correction of changing sin into error. “The attraction of guilt is found in sin, not error. Sin will be repeated because of this attraction. Fear can become so acute that the sin is denied the acting out, but while the guilt remains attractive the mind will suffer and not let go of the idea of sin. For guilt still calls to it, and the mind hears it and yearns for it, making itself a willing captive to its sick appeal. Sin is an idea of evil that cannot be corrected and will be forever desirable. As an essential part of what the ego thinks you are, you will always want it.” (Tx.Or.Ed.19.25) The ego does not dislike sin. The ego is very attracted to the guilt. It wants that guilt. It seeks that guilt out. It sees it in another; it sees it in ourselves. The ego wants the guilt in ourselves. It’s part of the ego’s insanity. Here is the great attraction of guilt that seduces us time, and time, and time again. It’s no different to see the guilt out there than it is to see the guilt in ourselves. A Course In Miracles is profound in its teaching that tells us that the guilt out there, and the guilt within, is exactly the same guilt and that there isn’t any difference. There’s just as much guilt within us as we think that there is guilt out there in the world. It’s all the same. I was looking on the internet about loving the sinner but hating the sin and what traditional Christians had to say about it. As I said earlier, the Christians and theologians said that this statement was not consistent with Christianity, even though many Christians had popularized it. I went to a web site . The web site was subtitled, “165,061 Bible Questions Answered!” For a Biblical, site I found it fairly enlightened. It wasn’t filled with hate and judgment. It was still a good Christian site that was trying to answer fundamental questions. I want to read to you what it said about loving the sinner but hating the sin. I am going to read this because it shows how different A Course In Miracles is from what traditional Christianity is teaching, even though ACIM uses many of the same words. There is nothing mean spirited about what I am going to read. It is just that the theology is so different. “Many Christians use the cliché ‘Love the sinner, hate the sin.’ However, we must realize that this is an exhortation to us as imperfect human beings. The difference between us and God in regard to loving and hating is vast. Even as Christians, we remain imperfect in our humanity and cannot love perfectly, nor can we hate perfectly, in other words without malice. But God can do both of these perfectly, because He is God! God can hate without any sinful intent at all. Therefore, He can hate the sin and the sinner in a perfectly holy way and still be willing to lovingly forgive at the moment of that sinner’s repentance and faith.” Then the web site stated three Bible verses you can look up that will justify this position. It said that God is perfect in His hate, because God can hate without malice, but we as imperfect humans, can not hate without malice therefore we have to be careful about our hate. This is a vastly different teaching. This article appeared in the November 2008 (Vol. 22 No.9) issue of Miracles Monthly . Miracles Monthly is published by Community Miracles Center in San Francisco, CA. CMC is supported solely by people just like you who: become CMC Supporting Members, Give Donations and Purchase Books and Products through us.